Ads began appearing in The Phonoscope for the Vitaphone in August 1899, and already by September the editors of that trade magazine wondered loudly how long the game would last. They also believed that the records, while of good quality, were duplicates of Berliners. 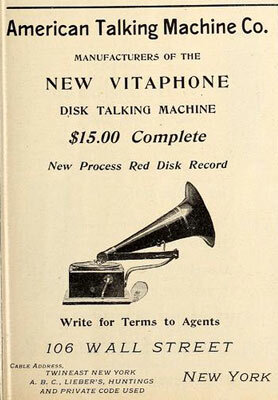 Berliner’s lawyers charged that the patents of American Graphophone covered only vertical processes, meaning ATM infringed on their client’s lateral process. This argument won the day and shuttered the Vitaphone operation. Now, collectors and historians try to piece together the history of this company from fragments of information and very scarce numbers of discs—usually shot all to hell—extant today. They’re not the oldest records, but they are among the most mythically rare. For our Anthology of Dan W. Quinn, we’re happy to share with you not only an ATM example but also the finest specimen of one we’ve ever encountered. It’s No. 285, “Say You Love Me Sue,” written by Harry B. Smith and John Stromberg. We’ve got some audio samples from the record’s beginning that show Quinn’s announcement, the opening piano part, and the first line of the song. First off, in the raw transfer, do you hear that whirring sound? That’s ATM’s lathe coming up to speed—pretty bush league, but an exciting artifact for us to witness! Secondly, listen to Quinn’s announcement, clearly stating the record is made for the American Talking Machine Company. This is *not* a pirate, after all. Third, notice how wobbly the piano is: that’s another defect in the lathe. The overall quality of the record is high, but the recording process was not technically proficient. In the first pass of restoration, you can hear the music being called forward and the noise and clicks being pushed back. A couple more stages of restoration followed until we got our master track. Now we’ve removed the start up of the lathe (sorry! ), but more importantly, the piano has been smoothed out. Our collaborator and owner of the disc, David Giovannoni, has applied pitch and flutter correction using Capstan, software out of Germany by the Celemony company. We also needed to do some selective EQ to bring more fullness to the piano (without adding rumble) and control top-end hiss (without sacrificing fidelity of Quinn’s voice). Here’s what we’ve got. 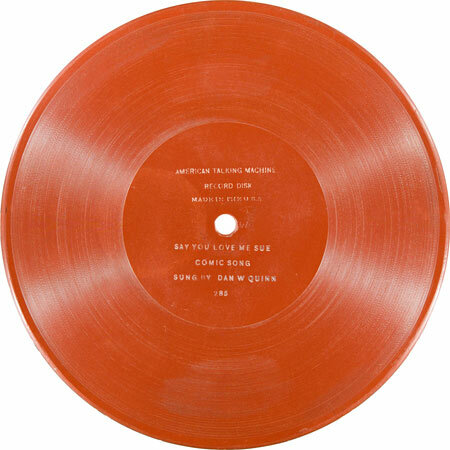 I have one of these records and its black, not brown. Its “The Prize Cake-Walker is Uncle Sam”. I think its numbered 278.